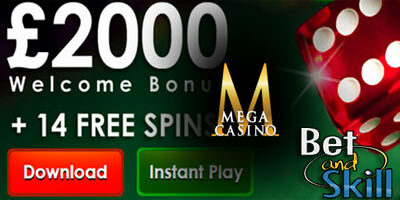 Join now Mega Casino and try the best online slots with 14 Free Spins without having to deposit! Simply register an account and redeem the promotional code 'BetAndSkill' at the cashier. You can play online casino classics like BlackJack, Roulette and Poker or dive right into the big-name pokies like IronMan, Batman and the awesome Cleopatra’s Secrets! The 14FREE Bonus is a free money bonus. It is valid on all games excluding jackpot games. The Bonus has a x60 wager requirement. "Mega Casino €/£14 no deposit free spins | Roulette | Video Poker | Slots"